I like to think of our household as being fairly clued on when it comes to recycling. We do the usual, composting for the garden; food waste in the yucky brown container; plastic, paper, cardboard and glass in the ever more flimsy green bags (provided by our local council) and regular visits to the neighbourhood recycling site to help preserve the planet. However of late, there has been a strong debate in the media, and elsewhere, about banning single use plastic straws. If you have followed some of my recent posts on social media, you will probably, by now, have guessed that I am a regular user of such “offending” items. 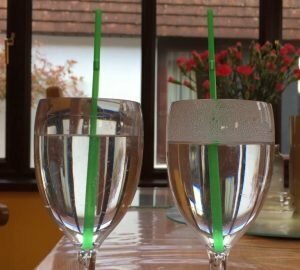 The so-called “crusade” on these straws has been championed and or debated by such great British institutions as the BBC One Show, the Chris Evans Radio 2 Breakfast Show, the Jeremy Vine Show, and none other but that stalwart of forward-thinking and creative politics … the Rt. Hon Michael Gove MP. Now, if you take what Mr. Gove has previously done with the legal system, the chaos caused by the fiasco after the Brexit vote, his tenure as Secretary of State for Education and his current stint at the Department for Environment, Food and Rural Affairs, you can see why I am so concerned for the humble straw … This humble piece of plastic is the means by which many disabled people are able to enjoy independence on a daily basis, never mind when dining with family and friends, or just out for a quiet drink in the local pub. Historically, did you know … that drinking straws represent one of the oldest eating utensils. However, their popularity came with the Industrial Revolution and the introduction of the Rye Grass Straw, and later paper straws. For readers born in the 1950’s and 60’s, I am sure you will have fond memories of birthday parties, where your lemonade, squash or cola, was drunk through a paper straw … and after you’d finished you would simply chew it up, and leave it on the party table for some unsuspecting Mum to come along and scoop up your DNA! Anyway returning to the present-day, I have been following the straw debate, and getting more and more frustrated with the “Ban the Straw” bandwagon, as it all seemed to be incredibly one-sided. Therefore, I recently took to my twitter account @RosieMS and tweeted about it saying “Banning single-use plastic straws really is the last straw for me. Thousands of Disabled people like me, can only drink independently with straws. 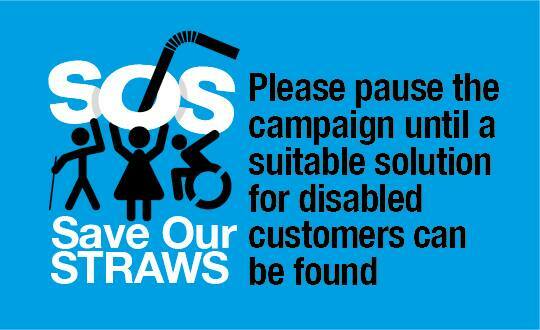 Wax coated paper straws don’t bend & taint the flavour of drinks SOS.” SOS standing for Save Our Straws. I included the following in my tweet – @MichaelGove @BBCNews @BBCTheOneShow @theJeremyVine @achrisevans – in the hopes that they might pick up on my concerns and balance the argument … but not a dickie bird was heard. 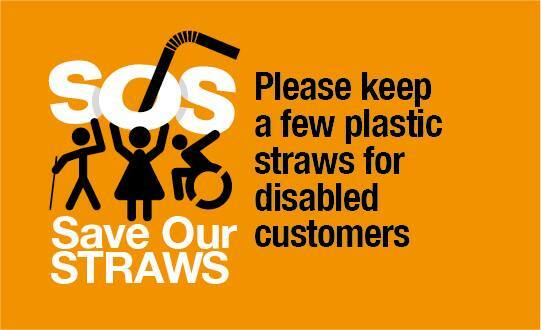 I then joined in on a thread with @CDSLeeds (Centre for Disability Studies, University of Leeds) and others on the very same subject; this time adding hashtags – #SaveOurStraws #SOS. There were discussions about biodegradable straws, stainless steel straws and reusable straws of which, hitherto I confess, I was not a great fan. However, in the spirit of open-mindedness, I decided to order some biodegradable straws which arrived promptly care of Amazon UK. Not unsurprisingly they are green in colour, they are more or less the same length and equally as flexible as regular plastic straws; they are not flimsy like a paper straws and, more importantly, they are not rigid or tainted with the smell and flavour of wax-coated paper straws. With further research, I discovered some people had voiced concerns about using them in hot water, so I undertook a very non-scientific experiment on the eco-friendly biodegradable straw – against my regular single use plastic straw. In the image below, the left glass has cold water, and in the right glass boiling hot water. Left to their own devices for five minutes, there was no major difference between the two straws, although the straw in the boiling hot water was marginally softer it certainly did not disintegrate in anyway. On the back of the box in which the straws arrived was a notice giving information about the degradation process. It stated that as soon as the product comes in contact with heat, moisture and bacteria the degradation process begins. Within a few months the structure of the product breaks down leading to total degradation. Since uploading this Blog, the suppliers from whom I purchased the straws, have advised NOT to use them for hot drinks, in view of the way the straws start to bio-degrade once they come into contact with hot liquid. Typically regular plastic straws vary in price from £1.99 – £4.00 for 250 straws. The Biodegradable straws that I purchased, range in price from £2.01 – £6.45 for 250 straws. A little more expensive, but in the scheme of things not too bad. I should say, in the spirit of true impartiality, other eco-friendly products are available as well … for example, reusable bamboo drinking straws, reusable stainless steel drinking straws, reusable glass drinking straws … and you can even purchase disposable compostable wheat straws. What more of a natural product could you get than wheat – although I’m not sure this option would be any good with hot drinks. 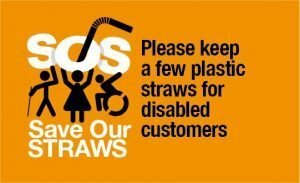 As I continued on my straw journey, I came across One in Five – a Scottish Disability Organisation who, like me, had taken up the mantle of saving the straw. One in Five very validly made the point that metal straws are dangerous for people who have involuntary bites and for people who have neurological conditions such as Parkinsons. One in Five (@oneinfivescot) have been running a campaign on straws, ironically also using the hashtag #SaveOurStraws (great minds think alike). 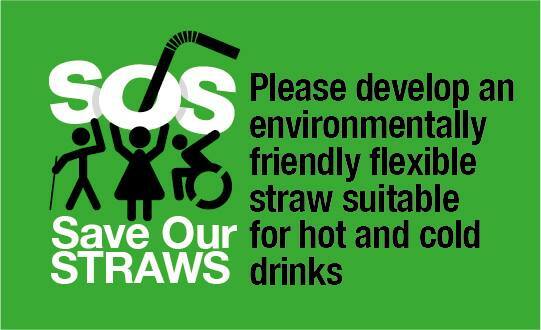 They are currently using some wonderful SOS (Save Our Straws) images (see below), and I would encourage everyone to share them as far and wide as possible. Like many people, I too want to preserve our planet – but there is a fine line between targeting an “easy” product such as single use straws that (undoubtedly are not good for the environment) but are also of enormous use to disabled people. I consider myself to be an advocate of all things good. However, I also want to be able to drink without asking someone for help. I think that in championing the sustainability of the environment, pressure groups, celebrities, and politicians could do well to look at the wider picture. Instead of looking at the BASE line (Banning All Single use Straws) we should be encouraging our environmentalists to promote the BOSS (BiOdegradable is Safe and Sustainable). I have many friends and acquaintances in the hospitality industry, who have the knowledge and connections to help make our environment ecologically sustainable; and I know they will understand and empathise with the plea in this message. But for everyone involved in preserving the ecology of the planet (and that is really all of us) please, don’t take the easy option and support the ban on the use of straws. Or, even worse support the universal use of wax lined paper straws that taint the flavour of the drink … whatever the tipple is … whether tea or Tia Maria. Take the lead, be the BOSS and support the #SaveOurStraws campaign.